The cost and large size of early radios made them status objects for the home. Their housings were made of wood and often imitated cabinet furniture in traditional styles. 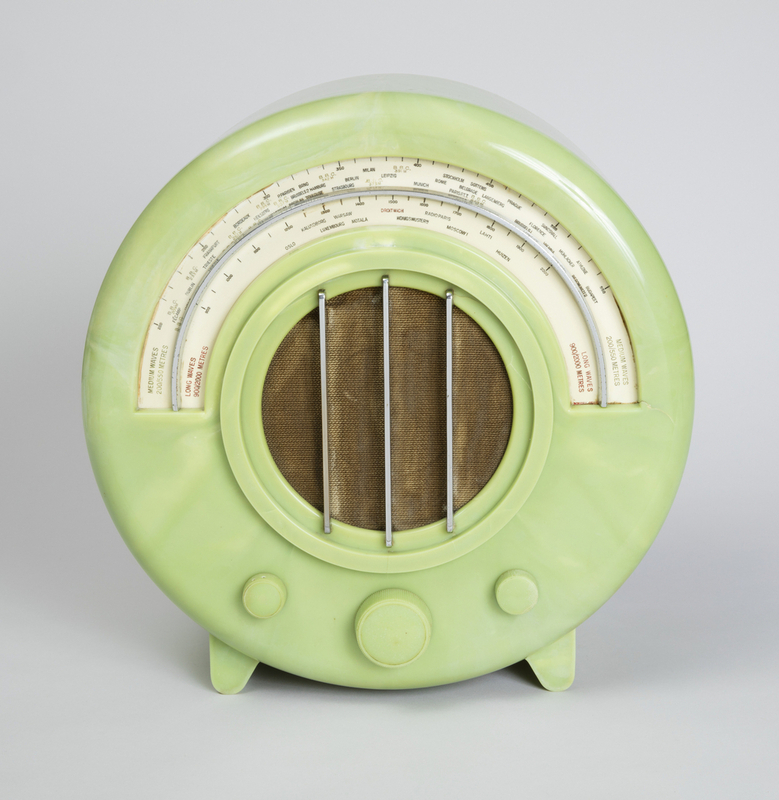 But, by the early 1930s and the rise of Modernism, sophisticated consumers began to update their interiors, and furnishings such as radios followed suit. In 1930, English radio manufacturer E.K. Cole, Ltd. (Ekco) decided to sell radios in plastic housings, and established its own Bakelite production facility. Two years later, in an effort to increase sales, Ekco initiated a design competition seeking to modernize their radios. A number of notable designers submitted entries, including Serge Chermayeff, Raymond McGrath, and Wells Coates. Coates, who had studied engineering, and had a successful architecture and industrial design practice by 1932, won with the only circular design. His entry emphasized function and a reductive modernist aesthetic. The shape, designed to fit a circular speaker, showed his understanding of radio components. By avoiding sharp edges and corners, his design also exploited the properties of molded Bakelite to achieve a sleek minimal style. The use of the circle also reduced the number of molding tools required for production, thus reducing the cost. Ekco introduced Coates’s design in 1934, as the model AD-65. The large table-top form is characterized by its circular shape and the clear layout on its face—the circular speaker grille in the center, with a large, readable station indicator above, and three control knobs below. The Bakelite case came in a wood-toned brown or black. The AD-65 became one of Britain’s most popular radios, and additional colors, “pearl ivory,” and “onyx” green, as seen in this example, were added. Coates went on to design a range of circular radios for Ekco, including a larger, more expensive model. Cynthia Trope is Associate Curator in the Product Design and Decorative Arts department at Cooper Hewitt, Smithsonian Design Museum.